In April 1990 the second of the Kairos programs, Kairos Outside, held their first weekend in Northern California. The third Kairos program, Kairos Torch, had its first weekend in September of 1997 at a youth facility in Oklahoma. Kairos Torch was developed uniquely to address young people (25 and under) experiencing incarceration through one-to-one volunteer mentoring. Today Kairos Inside, Kairos Outside, and Kairos Torch are supported by a staff of 12 and have more than 30,000 volunteers donating three (3) million hours of service each year. Kairos sprang from the Cursillo movement and is supported by volunteers from the 4th Day movements such as Cursillo, National Episcopal Cursillo, Presbyterian Cursillo, Lutheran Via de Cristo, The Upper Room's Walk To Emmaus, and independently ecumenical Tres Dias, as well as volunteers from independent and non-denominational churches. These volunteers serve in more than 400 correctional institutions and 86 communities in 37 states and 9 countries: Costa Rica, Australia, Canada, Dominican Republic, Honduras, Nicaragua, Peru, South Africa and the United Kingdom. The first three-day “Short Course in Christianity” in the U.S., called “Cursillo in Prison,” was held at Union Correctional Institution in Raiford, Florida in the fall of 1976. By 1978 six additional states were presenting “Cursillo in Prison” programs. The National Cursillo Center in Dallas surveyed these separate prison Cursillos and determined they should be ecumenical, supervised by a central authority, to better serve inmates’ needs. Kairos Prison Ministry is a Christian ministry rather than a movement. While volunteers and staff serving in Kairos must be Christian and follow the Statement of Faith, Kairos Prison Ministry International, Inc. extends the ministry to all people affected by incarceration, regardless of their religious beliefs, gender, race or ethnic background. There are three programs in the Kairos Prison Ministry: Kairos Inside, Kairos Outside, and Kairos Torch. While each has a unique target group, the core program is the same: Volunteers hold an Introductory Kairos Weekend, where they lead the participants through a carefully structured series of talks, discussions, chapel meditations, and music. The program takes the participants on a journey of self-discovery and relating with one another through the love and forgiveness of Jesus Christ. Following the weekend experience, Kairos Inside and Kairos Outside participants or guests gather regularly for accountability, support and prayer. Kairos Torch participants meet one-to-one with a mentor for 6 months following their Weekend. Kairos Inside is composed of well-organized and well-trained inter-denominational volunteer teams – both clergy and laypersons – who work in cooperation with the prison Chaplain. The Chaplain carefully selects up to 42 positive and negative inmate leaders to attend a 3 ½ day Weekend led by same gender Kairos volunteers. The program concept is to build the Christian community inside the prison, where the Kairos Community prays and fellowships together on a regular basis. These “Prayer and Share” Groups meet weekly. 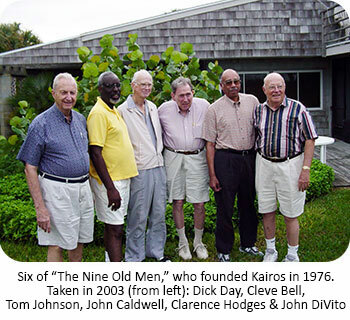 In addition, each month volunteers return for a “Reunion” of the entire Kairos community. As the Kairos Christian community inside a prison grows and begins to gain influence, the incidence of prison violence decreases. The fact that we return again and again to each prison is what distinguishes Kairos from other prison ministries. Without our follow up support, the efforts of the 3 ½ day retreat would quickly be lost to the prison environment. The Kairos Inside program helps prisoners re-enter the outside world with a God centered perspective and a new desire to become productive citizens. The idea of Kairos Outside came from the chaplain at San Quentin State Correctional Facility in California in 1989. After the first Kairos Inside Weekend he, along with others involved in the Kairos ministry, felt that the prisoners who became involved in the Kairos program were now open to family unity, more so than ever before. He asked Kairos to create a program that would minister to the female family members of the incarcerated. California volunteer Jo Chapman and several other volunteers took the chaplain’s idea and developed the Kairos Outside program. The first Kairos Outside Weekend was held in Northern California in 1990. The Kairos Outside Weekend is a 2 ½ day weekend program based on a series of talks and meditations by volunteers that address the pain of enduring separation from the one inside, and the judgment of others from their community. Families “do time” right along with their incarcerated relatives/friends. In a safe environment with loving people, women interact with women who are in similar situations and learn to form small groups to give them strength for the challenges they face. After the Weekend, the women journey together through SWAP (Share, Witness, Account & Pray) and Reunion meetings. The continuing ministry of Reunions and SWAP groups allow the women to grow in their Christian faith and become active members of the Kairos Outside community. In 1995 the Florida State Department of Corrections reported that approximately 34% of their inmate admissions were 24 years of age or under. At the Summer Board Meeting it was proposed that the national office form a study group to consider development of a program for those age 25 years old and younger. Over the next two years, committees refined a program for youth, and Kairos Torch held its first weekend in September of 1997 at a youth facility in Oklahoma, offering Christ’s unconditional love and acceptance to the incarcerated youth. For some, this is the first time in their lives they have freely received compassion and love. Following the 2 ½ day Torch Weekend, volunteers commit to a weekly, six-month one-to-one mentoring process with the youthful offenders – encouraging them to recognize their God-given potential and helping them to develop the skills necessary for a productive life. The result is hope for the future and a chance to break the cycle of crime. "Stories of heartwrenching, risky change abounds at Kairos. The cost and risk of being Christian is high (and) at times involve beatings and persecution. It is not an easy way but brings more true joy and freedom (even in jail!) than anything else offers. We in the free-world have much to learn from the courageous faith of the brothers-in-white."